When you are an obsessive crocheter like me, a lot of what you make comes to feel fairly disposable. After all, there are only so many hats and scarves one family can use and when your friends cease to be surprised at your home made offerings at their birthday parties. . .well, you could pick up another hobby or you could start donating or if you are really good at marketing selling, but sometimes you just wish that you were making something that would be valued and treasured. 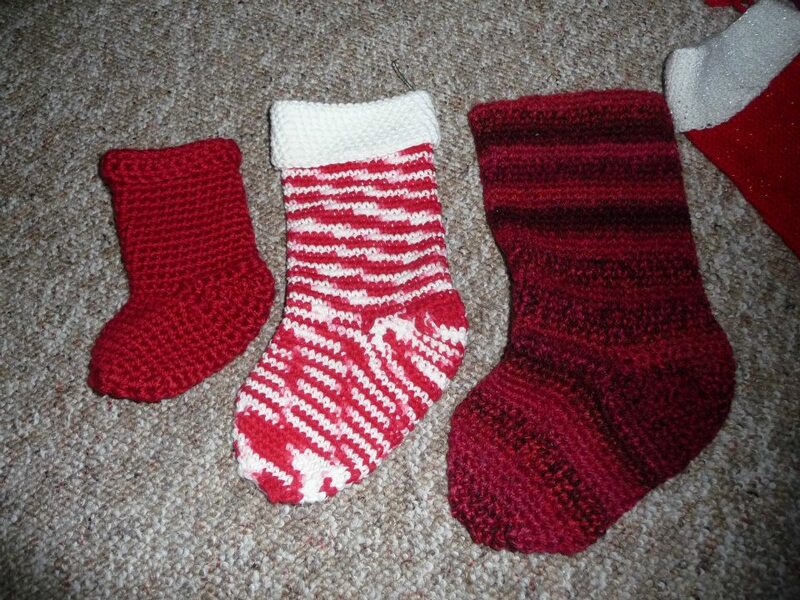 For me the only items I've made that I hope will become heirlooms are my Christmas stockings. My toys, hats, and doll clothes are meant to be enjoyed and used, maybe even used up, but my stockings I want to see brought out every year to be treasured and admired, filled and emptied, and then carefully tucked away until next year. I want my girls to take them with them when they leave the home. I want to make new ones for my grandchildren someday. 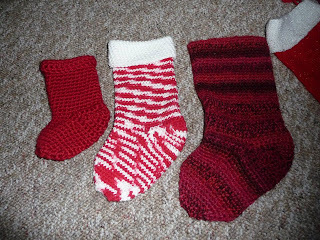 . . Stockings are something that a crocheter can do that makes a lasting impact. For the most part a stocking pattern is really straight forward. The only real kink comes in that oh so tricky heel. 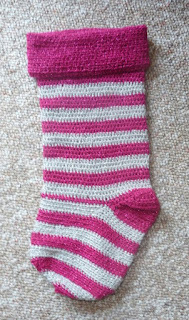 The best instructions I've ever found for a crochet stocking are here: Free Crochet Pattern: Holiday Stocking. This is a free pattern, but it is through lionbrand.com and you will probably have to register with the site to view it (you can choose whether or not to receive email updates from them. . .I do because they include more free patterns. The subscription is free.). The heel is still a little tricky (it took me a little bit of thinking to figure it out), but once you get the hang of it, it is easy to do and even to alter so that you can switch up the size of your stocking and make one that is larger or smaller than the three sizes given here (I find I almost always need to make it larger). You can see samples made from this pattern in my various photo albums on my Critters for Coryn Facebook page. Here are three in three different sizes. Anyway, I thought it might be helpful for you visual learners if I posted my own tutorial about the heel. Row 1: Ch 1, turn, sc in first 6 (12, 20) sts (for Heel); leave remaining sts unworked. Row 2: Ch 1, turn, sc in first 4 (8, 14) sts; leave remaining sts unworked. Row 3: Ch 1, turn, sc in first 2 (4, 8) sts; leave remaining sts unworked. Row 4: Ch 1, turn, sc in each st across, sc in next sc in row below - 3 (5, 9) sc. Rep Row 4 until all 6 (12, 20) Heel sts have been worked. Do not fasten off. Rnd 1: Ch 1, turn, sc in the 6 (12, 20) sts of Heel; sl st in side of Heel; sc in next 6 (12, 20) unworked sts of Leg; sl st in other side of Heel; do not join. Here are some poorly focused pictures (someday I really need to get a handle on photography). Anyway to build up the heel, you want to start by making a "pyramid" foundation of three rows decreasing in size each time. The first row in this example (I'm making a wider stocking than the ones in the pattern given on the site) is 26 stitches across so, Ch1, turn, sc in the first 26 stitches, leave remaining stitches unworked. . . I decreased my row length by ten each time. I did not have a mathematical reason for doing this. It just looked right. The important thing is to have each row decrease evenly (If you'll notice in the original pattern the smallest size goes "6, 4, 2" decreasing the row by two each time, the next "12, 8, 4" which is a decrease of four, and the last "20, 14, 8" so a decrease of six. I didn't count my original stitches, shame one me.). In the original pattern the first row equals half of the stitches in the original round you would be working on for the leg of the stocking. I find that when the stockings to get be larger (mine was roughly 70 around) this leads to an awkward looking heel. I chose 26 stitches as my first round even though this was a good deal shy of the 35 stitches that would make a true half. My rows were 26, 16, and 6. The picture below shows these rows. So after you make the 6 row, you will chain one and turn, single crochet in all six stitches, and then dip down and single crochet into the row below, as shown in the next photograph. Now chain one and turn and do the same on the other side. Single crochet in the (now) seven single crochets and dip down, single crochet in the row below. . .this may feel awkward and strange but after a few rows, it will seem that the stitches are "consuming' the pyramid shape creating a pocket of sorts for the heel. Below we have an example of what it will look like part way through. And if you fold the stocking in half you can kind of get the idea where this is headed. . . The heel here is definitely distinct from the body of the stocking. To fix this and start working in a round again (no chain one and turn, just around and around and around until you reach the toe and start to decrease) you want to do the following: slip stitch in the space between the heel row and the leg row (just below my thumb in the picture. . .yes, there is more than one loop here you could stitch into. Just do the one that is roughly in the middle.). Then do a single crochet decrease in the first two single crochets of the leg rows. This will pull the heel tight to the leg. Below we have the stitches I described above: slip stitch, single crochet decrease. . .then continue crocheting around until you reach the two stitches before the other side of the heel. 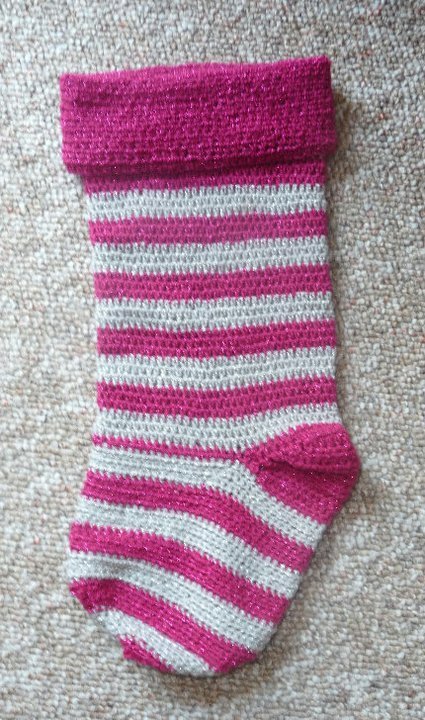 Reverse what you did on the first side (meaning: single crochet decrease in the two single crochets before the heel, slip stitch in the side of the heel rows, single crochet in the last single crochet of the heel row) and continue around. Is this making sense? I certainly hope so. . .
And here you have it. . .
At this point you continue to work in a round until your "foot" has reached the length desired. The two, as described in the pattern, is pretty simple. If it gives anyone trouble, please comment below and I'll be happy to post pictures of the process. I hope you can get your stockings done in time for Christmas!! !